Let’s discuss Book 1 of 1Q84! Read through my discussion prompts below, then add your thoughts on those or anything else you felt was important to you. Feel free to ask a question for me (or other book club buddies) to answer. And remember to check back to see if people have replied to your comments. 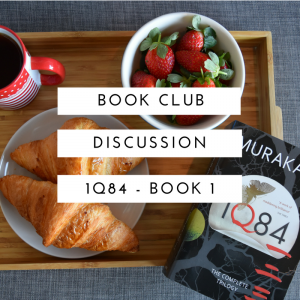 **WARNING** The discussion prompts and comments below will contain spoilers for 1Q84 Book 1. Only continue if you have read book 1!) And if you have read further please limit your responses to content covered in book 1. How do you feel about the first book overall? I’m really enjoying it, and though there are a lot of pages still to go I am flying through. Dual perspectives rarely hold my interest, but I am finding Aomame and Tengo’s chapters equally enjoyable. Do you have a favourite character so far? I really like Fuka-Eri, she is mysterious and strange, but she has a particular charm about her and I love that she is ‘walking through the forest’ rather than ‘along the road’. I’m definitely looking forward to unraveling more of her story. Music appears frequently throughout the first book, does this add to your enjoyment of the story? Why do you think music is highlighted in this way? I don’t recognise any of the music mentioned in this book, expect perhaps one 80’s pop song, but I know from some of the reading that I have done about Murakami that he is a great lover of music and in fact once owned a jazz/music bar in Tokyo. Music appears throughout many of his other novels that I have read, and I have come to expect it. Though I think I would appreciate the references more if I could listen to the music! I need a 1Q84 playlist, but to get started I’ve linked to the key piece that is referred to the most. Loneliness and isolation seem to be emerging as themes, did you notice these or any other themes as you were reading? Many of Murakami’s novels feature lonely or isolated protagonists, so I didn’t find it surprising when they began appear as themes. I like the way he explores the idea that one can be lonely but generally satisfied with life, and that isolation is sometimes a choice. Whether that becomes a personal prison or not depends on many factors. What are you hoping to see in parts 2 and 3? I am looking forward to learning more about the mysterious Little People, and what/who they actually are. I would also like to learn a bit more about the moon-base that has been mentioned a few times so far. Another great book choice this month! I don’t want to say too much as I’ve now finished part two and I fear any detailed review may hint at things to come. So I’ll keep it short, I’m enjoying this one a lot, despite it being a long book, I find I’m flying through it too. I must agree Fuka-Eri is my favourite character, I find her so intriguing. I really like the back and forth narrative between Aomame and Tengo, it works really well. This book is so mysterious and I have so many questions! At the end of book one, the main question I had is: what or who are these Little People? I’ll join you again in the discussion for book three as I’m so eager, I’m starting it now! Hi Janel, thanks for joining in and for sharing your thoughts. I’m so glad to hear that you are enjoying it so far too! I have found that I am flying through it as well, though I am on holidays, so I seem to have more time than usual for reading! I am surprised at how much I am enjoying the dual perspective, it really is rare for me to enjoy multiple point of view books. The is something about it in this case which just ‘works’ especially as their stories become more intertwined. I definitely need to know more about the Little People, but knowing Murakami we may not get all the information even by the end of the book! Good luck with book 3, and I look forward to discussing it with you. If you have any burning questions you would like me to feature in the discussion please send me a DM on instagram (either @babblingbooks or @babblingbookclub) and I can work them in, otherwise you can just ask them in your comment. I’m so glad that I had the chance to join this bookclub. 1Q84 has been in my pile of summer reading, and I always find it more enjoyable to read a book of this magnitude and complexity when I can share my thoughts and impressions with other readers. Because of my busy schedule, I am alternating between physically reading and listening to the audio-book. I am especially enjoying the audio-book for several reasons. First, the narrators are very good and bring these characters to life, and second, I like hearing the pronunciation of the various character names, places, and unfamiliar terms. Although I like all of the characters, Aomame is my favorite. She surprised me from the start, but what I like most about her is that everything she does fits in with her personal philosophy of life. She is both extremely strong, but also incredibly vulnerable, which makes her seem very real to me. This is my first Murakami book, and I’m looking forward to reading more. I’m finding his book very informative as well as entertaining, and I love the music and literature references. While reading I had to check out Janacek’s Sinfonietta, Bach’s Well Tempered Clavier, and the writer Murasaki Shikubu. I keep a notebook so I can jot down notes as I go along. Some other themes I found interesting in this book are memory, and the known and unknown. Both Aomame and Tengo are strongly affected by their memories: Aomame by her memory of Tengo and her feelings for him, and Tengo by the memories of his parents, especially his mother. They both are also unsure of what is they know and don’t know. Aomame finds herself in an altered world, and Tengo is not sure if his memory is reliable. What I am most looking forward to in Book 2 and Book Three are finding how who is running Sakigake (who the mysterious leader is), and seeing Aomame and Tengo cross paths. I’m also hoping that Aomame’s friendship with Ayumi does not backfire and cause serious complications. Thank you for joining in, and for sharing your thoughts! I love your observation that Aomame is “both extremely strong, but also incredibly vulnerable” that is a really perfect summation of her character. I think she has been written really well, especially as Murakami is not known for being especially good at writing female characters. It’s also great to hear that the audiobook narration is good. I adore audiobooks but have not tried a translated novel in audio format. I can imagine that it would be very helpful with the pronunciation, and I think I might give the a try when I come across a novel translated from a language I am not familiar with. Memory is SUCH an interesting theme in this book, you’re right. Both those examples are terrific, and I think Fuka-Eri’s lack of engagement with her memories, or perhaps the fact that her memories have become the book ‘Air Chrysalis’ is yet another example of memory playing an important role in the plot. Last of all I have my fingers crossed about Ayumi too, that friendship seems to have an air of danger or tension and I get very nervous whenever they are in a chapter together! Glad to hear you are enjoying your first Murakami so far, and look forward to hearing your thoughts as we make our way through the next 2 books. I am so glad you chose this book! I have owned a copy for several years, but it never made it off my TBR pile until now. •In regards to the first question, how I feel about the first book, I am loving it! It pulled me right in and absorbed me. It is very easy reading. •Do you have a favorite character so far? I like several of the characters a great deal: Aomame, for her strength and vulnerability (as others have already mentioned), Tengo, because I like the contrast between his large, strong physical appearance and his thoughtful, scholastic character, and his love of mathematics and writing, Fuka-Eri for her mysterious nature, she also seems very vulnerable and fragile, and all three characters seem to share relatively unpleasant if not downright awful childhoods. I also really like the dowager and Tamaru. •Music is a recurring theme in Murakami’s work- I see Sinfonietta as one of the threads that bridge the worlds of Aomame and Tengo. •Emerging themes- besides loneliness, isolation, and memory, it seems that ethics/morality are also coming into play, with the way the dowager often tells Aomame that she/they are doing the right thing with “moving the men to another world”- I am not sure if she is trying to reassure or convince both herself and Aomame. I also enjoyed the discussion between Aomame and Ayumi about McLuhan’s work: “The characteristics of the package determine the nature of the contents, not the other way around”, and, earlier on, when the dowager speaks about the death of butterflies: “…but I can never find their bodies. They don’t leave any trace behind. It’s as if they have been absorbed by the air. They’re dainty little creatures that hardly exist at all: they come out of nowhere, search quietly for a few, limited things, and disappear into nothingness again, perhaps to some other world.” These two passages seem to be foreshadowing something. I am also intrigued by the parallel drawn between the mysterious Fuka-Eri and the obscure Gilyak people. •In parts 2 and 3, I am hoping for more information on the Sakigake commune and the Little People. I would like to see justice for little Tsubasa, although I am afraid that Aomane might try to infiltrate the commune and bad things happen to her. I like the way the characters’ storylines are beginning to converge, I am looking forward to a meeting between Aomane and Tengo. I also want to learn more about the little second moon. I am really looking forward to Books 2 & 3. This is hilarious!! And so perfectly apt! I have just finished the discussion questions for book 3 and the preparation of food gets a mention – and ALL those other things are present in 1Q84. It seems that Murakami certainly plays to a particular style and set of themes in his writing! !